August 9, 2010 - Air Traffic Controllers in Spain have overwhelmingly voted to strike over new government regulations that would reduce million dollar salaries. That's correct million dollar salaries. The air traffic controllers’ union, Union of Air Traffic Controllers (USCA) reported that of their 2,300 controllers, 92 percent of its union members showed up to vote, of that number, 98.25 percent voted in favor of a strike. Under government regulations the union would be required to give a ten day notice if their members choose to strike and the earliest USCA members could strike would be mid August. Like every country today, government officials worldwide are looking for ways to cut their budgets. Spain is trying to rein in 11.2 percent of GDP. Spain’s socialist government began going through the county’s expenditures and one of the areas they reviewed, was its airports which are run by the state operator, Aeropuertos Espanoles y Navegacion Aerea (AENA). Government officials learned through an audit that air traffic controllers’ salaries had got out of control and that some of the air traffic controllers were making as much as $1,067,694.98 United Sates Dollars (USD) (€810,000), ten times the pay of Spain’s Prime Minister. - 10 controllers were paid between $1,067,694.98 USD (€810,000) and $1,186,331.16 USD (€900,000) last year. That fact that Spain’s air traffic controllers were paid in some cases ten times more than the country’s Prime Minister and 50 times the average salary, has provoked outrage from government to the every day worker. Spain’s Prime Minister receives an annual salary of $121,258.57 USD (€91,982) and the average worker salary in the country is $23,842.96 USD (€18,087). Government officials called the "millionaire salaries" enjoyed by the controllers "incomprehensible”. Under the new government regulations controllers will be required to work 1,600 hours a year or 30 hours a week at an annual salary of $260,000 dollars (200,000 Euros), reduce rest periods and cuts in overtime benefits. The controller’s current contract stipulated a working year of 1,000 hours and overtime was paid at triple time. Many of the controllers had over 600 hours in overtime last year. The government has reported that they will use the military if need be to man air traffic control facilities should a strike take place. The government also said they are investigating sick leave taken by air traffic controllers last month at their control center in Barcelona in which half the controllers did not show up for work. The government also said they are investigating sick leave taken by air traffic controllers last month at their control center in Barcelona in which half the controllers did not show up for work. At that time, with out providing reasonable notice, air traffic controllers in Barcelona called in sick alleging medical reasons for their absence. As a result the Spanish Airports authority AENA was not able to replace these workers which caused considerable delays to flights in and out of airports in Alicante, Valencia and the Balearic Islands. Military air traffic controllers at San Javier Airport had to direct civil air traffic since the airport opened and have been paid a fraction of their counterparts. In order for the military order its controllers to fill in for civil air traffic controllers role there must be an order given from the president of Spain. Blanco has reported that the procedure in relatively an easy action “we wish we didn’t have to do it, but unfortunately it appears to be a necessity.” (see Air Traffic Controllers Walk Reagan Fires PATCO Strikers). Blanco said he saw "no reason" for a strike and called on the controllers to adopt the new rules "without delay." Blanco has reported that the government plans to cut air traffic control by at least $15 million USD next year through attrition, a hiring freeze and possible layoffs. Spain is also looking at airport closures and replacing some of its air traffic controllers with computer based technology at some of it smaller airports that have fewer than 50 flights a day. “I have taken the decision to take the bull by the horns and end the privileges of these controllers”, said Blanco before the Spanish Parliament, after it was surfaced that AENA, which manages Spain’s 48 state run airports, had recorded a loss last year of $395 million USD. 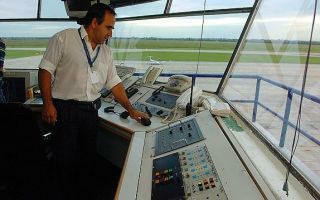 U.S. air traffic controllers earn a relatively fair wage and have good benefits. Median annual wages of air traffic controllers in May 2008 were $111,870. The middle 50 percent earned between $71,050 and $143,780. The lowest 10 percent earned less than $45,020, and the highest 10 percent earned more than $161,010. The average annual salary, excluding overtime earnings, for air traffic controllers in the Federal Government which employs 90 percent of all controllers was $109,218 in March 2009.